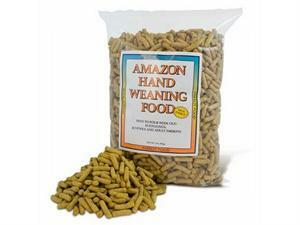 Amazon Hand Weaning is an elongated "pencil" shaped food about 1 inch (25 mm) long and .25 inches (6 mm) in diameter. It contains a higher energy level without excess fat which may be helpful in sustaining appropriate weight on birds that are weaning, moving to new aviaries, or otherwise making adjustments to new environments. Used for medium to large parrots. Benefits: Provides nutritional continuity from hand feeding right on through adulthood. Eliminates stressful transitions from the syringe to the food cup. Creates an essential lifetime "bond of trust" between caregiver and pet regardless of the bird's age. Readily absorbs warm water and retains its shape while "handed" to the fledgling. Scientifically researched, studied and tested. Captive manufacturing achieves unmatched quality and consistency. Measured and matched pre-mixes are used to control iodine, copper, iron, and selenium. Low available iron level is consistently safer for all birds. No substitutions are allowed in the formula to achieve unmatched consistency. Developed and tested by expert professionals including avian nutritionists, avian veterinarians, and avian caregivers. Recommended by avian, wildlife, and zoo veterinarians. More vitamins, minerals, essential proteins and oils than pet store products. Long-term use in multi-generational breeding proves the efficacy and safety of the protocol. Healthier, better-socialized pets are more enjoyable. Vitamin D3 3500 IU/Kg min.